Elements by Weiser® provides an expanded choice styles and finishes at an affordable price. The smooth simple lines of the Belmont lever and wave style design is an attractive addition to any home. This privacy lever is best used in interior bed and bath applications where privacy is required. Both levers are locked or unlocked by a turn piece. The outside lever can be unlocked by an emergency key.The lever is reversible and mounts on both left and right handed doors. The Venetian Bronze finish is hand-rubbed to reveal unique bronze highlights and provides a rich and warm complement to the Belmont's style. 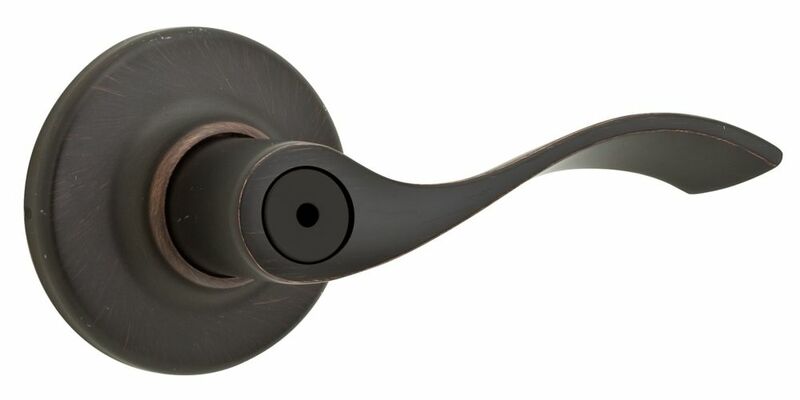 Belmont Privacy Lever Venetian Bronze Elements by Weiser® provides an expanded choice styles and finishes at an affordable price. The smooth simple lines of the Belmont lever and wave style design is an attractive addition to any home. This privacy lever is best used in interior bed and bath applications where privacy is required. Both levers are locked or unlocked by a turn piece. The outside lever can be unlocked by an emergency key.The lever is reversible and mounts on both left and right handed doors. The Venetian Bronze finish is hand-rubbed to reveal unique bronze highlights and provides a rich and warm complement to the Belmont's style.